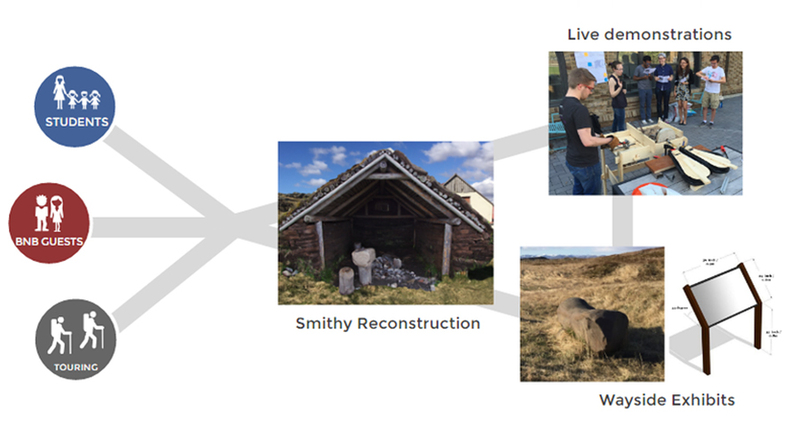 Four Northwestern students collaborated over the course of twenty weeks to construct a visitor experience for an exhibit that celebrates the cultural importance of Skallagrim’s anvil stone, an artifact from the Icelandic tale of Egil's Saga. The students, Denise Heredia, Angela Hosbein, Martin Hewitt, and Jenny Wang, represented both the Manufacturing & Design Engineering (MaDE) program and the Segal Design Certificate program. All of them were enrolled in DSGN 384-1 and DSGN 384-2: Interdisciplinary Design Projects for two quarters together. The mission of the project was to preserve the history represented by the Viking-age stone artifact located in Borgarnes, Iceland on land belonging to the client, Francois Maria. To achieve the mission, the team designed wayside exhibits, replica equipments, and live demonstrations around the topics of Skallagrim and viking iron-making to engage current visitors, share the history in a meaningful way, and raise interest in preserving this part of history. A final report with construction plans, infographics, and logistics for each of these components was given to the client. The plan is intended to be completed over the next three-five years. Team member Denise Heredia explained her perspective on the project. The artifact is Skallagrim’s anvil stone, a remnant of a 9th-century smithy built by the Viking Skallagrim, who was one of the first settlers of Iceland. His journey to Iceland with his family is described in Egil’s Saga, a literary work important to Icelandic culture and taught in Iceland’s schools. Today, the stone lies on a hill next to our client’s home. Icelandic high school classes, individual tourists, and saga enthusiast tour groups travel out to the client’s land seeking the stone. The team identified three steps to preserve that story and convey it to visitors. 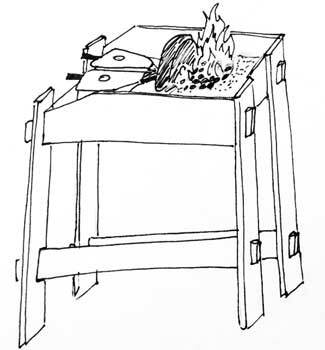 The bog iron smelting process. As research for the project, the team members familiarized themselves with the story behind the anvil stone and with the tools used to forge iron in the 10th century by reading historical documents and a translation of Egil's Saga. Team members researched the science of smelting and forging iron, and then communicated these ideas through informational displays and physical replicas. Building the forging table prototype allowed the team to test the functionality of their demonstration equipment and how engaging a demonstration and exhibit walk through might be for visitors at Skallagrim's Forge. The team ran four test demonstrations to see what first impressions or a tourist group might have. Heredia and Hosbein received a grant from the Don Norman Design Fund of the Segal Design Institute to visit Iceland and continue their testing in May 2016. The trip provided the pair with an opportunity to learn more about the local geographical and cultural context for the exhibit. The team's faculty advisors John Anderson and John Lake praised the team member's successful collaboration and communication, both qualities that are integral to the design innovation process. In addition to providing build specifications for the exhibit components, the team devised a three phase implementation plan in order to manage our client's limited time, design for flexibility, and prioritize adding value to the current visitor experience. The phases are structured to scale the exhibit content and infrastructure as more visitors are attracted to the site. Phase 1 focuses on capitalizing on the existing market of visitors to the stone. 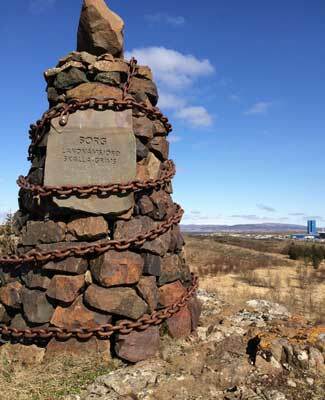 It provides visitors more context about the history of the stone as well as connects the stone to the history of ironworking in Iceland, beginning with iron forging. As more visitors are attracted to the exhibit, Phase 2 expands the historical content to include the entire iron-working process, from smelting to end-use tools. Infrastructure of the site, including signage and parking, is also increased to accommodate the growing market. Phase 3 expands programming to cater to people outside the day-trip market, including specialty organizations and bed-and-breakfast guests. In the DSGN 384-1,2 course sequence, students work in teams on interdisciplinary projects in a learn-by-doing format. Team member Angela Hosbein commented on how special that format was for everyone involved in the Skallagrim's Forge project.